I updated Crocodile Dentist with a new communication board. It was a popular game with my early language learners and I managed to wear out two crocodiles since the original posting in 2013. 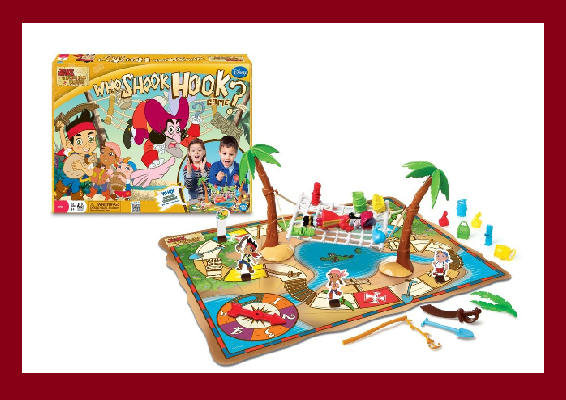 This was a great game for speech therapy reinforcement and to encourage communication. Apparently some of you are still using it. Readers have requested the communication board I made to go along with the game but unfortunately I don’t have it any longer. It was left behind with the game when I moved on to other schools. I no longer have access to the program Boardmaker to print the digital copy. 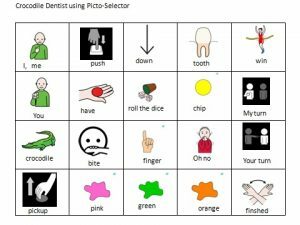 However, there is a free program called Picto-Selector that I have been using to make communication boards. This program may be a good option for some of you. Click on the colored print to find the site to download it. I made the board below using it. If you want to download this board click on the board below. Meanwhile, here are the game adaptations I posted about in 2013. Crocodile Dentist is a plastic crocodile that has a spring loaded mouth. The mouth closes when a certain tooth is pushed down. Kids enjoy the suspense of seeing who is going to get bit. I give the kids an option of using using a tongue depressor because some take this quite seriously. The trigger tooth changes location each time the mouth is opened. Some of you may already use this game for reinforcement. I thought you might like to know how you can expand its use a little further. I use it to expand a student’s verbal output to 2 to 3 word phrases using a communication board and to follow directions using prepositions. I colored the teeth alternating colors using permanent markers. I used pink, green, and orange because I already had a die that had those colors. If you don’t have a die you can make a spinner or use colors for a die you have. 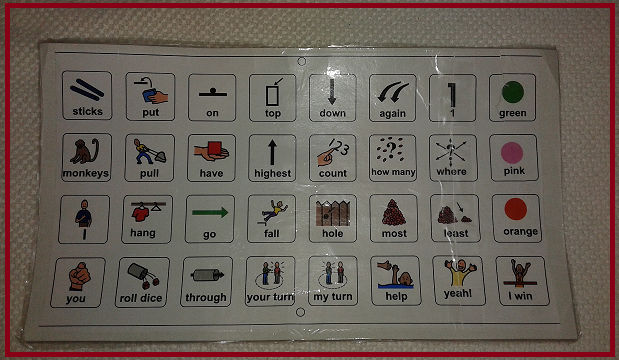 For my students with limited verbal abilities, I use the communication board along with the die in a plastic jar. I have the students shake the die to get the color of tooth they need to push down. I then model phrases using the communication board while playing the game. The game creates a lot of opportunities for repetition of phrases such as “I have ….” or “push down green tooth”. I also reinforce saying “your turn” and “my turn.” After repetition the students start to say the appropriate phrase when you point to the correct icons as a prompt. Finally, they may prompt themselves by pointing to the icons and verbalizing. This is a good way to break up an imitative pattern that often happens when training non-verbal children and uses a natural context for turn taking. The colors are used in the direction cards also. Click on the free download icon for the cards. Cards were made using the concept vocabulary: next to, beside, between, right, left, colors, not, side, front, either/or. Children take turns drawing the cards and following the directions for the tooth to be pushed down. We play a variation by giving each child three poker chips. They feed the crocodile a chip if he bites. The person who feeds all three chips is the winner. I provided a word program down load because I thought people may need to adjust the color words for their needs. If you have any difficulties with this, leave me a comment. 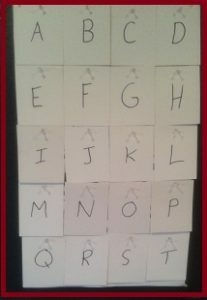 Print out the cards and have the students pull them out of a bag and then follow the directions while playing the game. A reminder that Teachers Pay Teachers is having a February sale. If you have been putting off purchasing, now is a chance to get a discount. Don’t forget to use the code. Are you assigned to work with upper grades next school year and wondering how you could work in the classrooms? Many of us are a bit intimidated to actually do this. For older students with language processing difficulties, working in the classroom may seem to be the best option. There can be many benefits. It is often a struggle to make therapy relevant for older students and they may resist being removed from class. It may be a hassle to schedule everyone around academic instruction and you have a lot of students in one particular class. Working in the classroom allows you to see how the students are functioning in class and you can see how instruction is being presented to the students. You can consult better with classroom teachers to meet the needs of your students. However, there are some downsides to the push-in model. You may not have control over your teaching environment and it may be less than ideal in large classes with limited space. There are the distractions of other students and you may feel like you are intruding on the classroom teachers space and time. If you don’t get the lesson plans ahead, you may not come adequately prepared for the lesson being presented by the classroom teacher. It is also difficult to work with more than one student in a class without being your own little group in the back of the classroom. If you have a high caseload, scheduling can become a nightmare with inflexible time blocks taken up by single students. I have experienced mainly two scenarios with the push-in model. In one, the Speech Language Pathologist, (SLP) works with a few students in the back of the room and scaffolds what is being presented by the classroom teacher using visuals or breaking it down in segments. This can be useful for a few students if done discretely. It can also be quite distracting to other students who want to see what is going on and not follow what the classroom teacher is presenting. In scenario two, the SLP takes over part of the classroom instruction and co-teaches. This can be quite effective, especially when the teachers can play off their strengths. It does require some advance planning and meeting time between teachers. For the SLP, it may be harder to meet the individual needs of the students you are targeting because you are working with an entire class. I find that taking data is really difficult because your attention is drawn in so many directions. Often It is hard to sustain this as our caseloads increase through the school year. Sometimes you may start with a handful of speech students in a class and then find the students you were targeting moved and you are left with one student in the time slot. The following are a few methods and activities you may want to try. These work best when information is being given in a lecture format such as with social sciences or history. You can work in the classroom with a small chosen group of students to write notes as information is presented and formulate questions on note or index cards. This activity can be expanded as a total class activity with some students receiving help and others being independent. It is important to include a question and answer on the card. The questions and answers can then be gathered and used later in a review activity with the whole class participating. This process helps students who need a rehearsal of information or information segmented. It gives students a reason to be engaged and helps those who have difficulty taking notes on relevant information. I have found game show type activities work well for reviewing at the end of a unit. Once you have it set up it can be used multiple times with little preparation. Now you can bring out the note cards the students have already prepared and swap them out at the end of each unit you review. I showcased a Jeopardy activity on a previous post. You can reuse this game by placing letters under the dollar amount cards. You may or may not have categories depending on the topic. Pile the question cards into draw piles corresponding to the letters and categories if you have them. You may want to have teams write answers on white boards to avoid blurt outs. If the question is answered correctly the person or team receives the dollar amount. Don’t forget to put bonus cards in to increase the suspense. 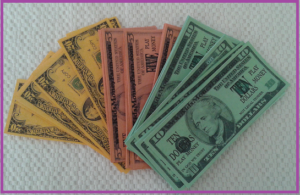 For some reason handing out fake money is a real incentive. I hope you have kept it from the previous post. Idioms of Fortune is another game I have made up. It can be used as a review game also. As a bonus it reviews idiom vocabulary at the same time. You may want to form teams again as in the previous game and use white boards. 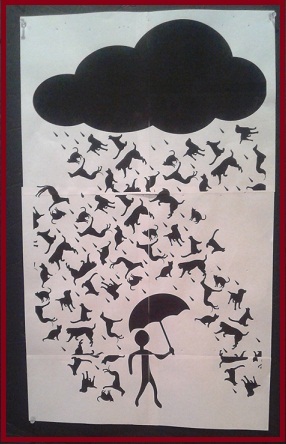 I print out a large illustrated version of an idiom. You may want to have a few of these on hand because sometimes it is figured out sooner than you think. I set the printer so it prints out the illustration on multiple pages and then tape the pages together to form one large picture. You can Google idioms and find quite a few. 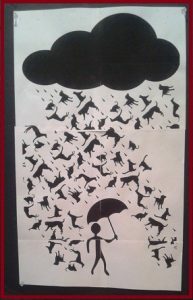 I used raining cats and dogs from openclipart.org because it did not have restrictions. This styro-foam poster board I found at the dollar store is turning out to be quite useful. I stuck my idiom picture on it and then tacked index cards on top so that the picture wasn’t visible. The smaller the cards the more questions that will be needed. It should look something like this. Then mark the cards in some fashion. I put the alphabet on mine. . Someone draws a question card and reads it. This could be an assigned student or the teacher. A student or team agrees on an answer to present. You may want to use white boards and have the teams write answers. Again this really helps with the blurt outs. 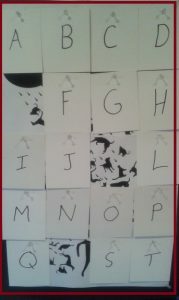 If they are right they can choose a card, look at the picture and then take a guess on what idiom is being illustrated. The first team to guess is the winner. This is what it may look like after a few cards are drawn. You may or may not plan a reward for the winning team. Some students find the competition is enough and don’t care about rewards. You may want to do the opposite type of reward and have the losing team do something silly like sing a nursery rhyme for the other team. Middle school students seem to like permission to be silly. Agree on the terms before starting. I hope you find these activities useful. If you have information to add to this topic, please comment. game adaptations, Therapy Activities from Scratch	game adaptations for speech therapy, Speech Therapy for older students, therapy materials from scratch. 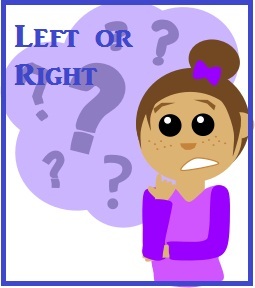 I don’t know about you but I’ve found that the concept of left and right can be one of the most difficult for students to grasp. Because of this I am always on the look out for ways to incorporate it into my activities. I am going to showcase a few games I have used during therapy sessions to reinforce the concept plus add little incentive for the other goals we may be working on. The students don’t realize it but my games are often selected for a dual purpose. First off I usually show my students how to tell their left from their right . 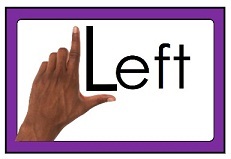 When they place their hands palm sides down, their left had will form the letter L which stand for Left. Easy Peasy Classroom has a nice set of posters to illustrate this. Click on the picture and it will take you there. I recently found the game called Left, Right, Center. It is less than $7.00 at stores such as Wal-Mart, which is a reasonable price for my budget. It is also small for carrying in my therapy bag. It is a dice game that is a nice incentive game because turns are quick and it is more of a game of luck than skill. This means that any of my students can be successful regardless of abilities. It also gives multiple opportunities to figure left from right. The game consists of chips and a set of dice with the letters L, C, R or a black dot. Everyone starts with 3 chips. Players roll the number of dice that corresponds to the number of chips they have. They pass the chips according to the roll on the dice. L means a chip to the person on the left. R means a chip to the person on the right. C means a chip to the center of the table and a black dot means you keep a chip. Eventually there will be only one person left with chips and they get to claim the center. Then the game is over. 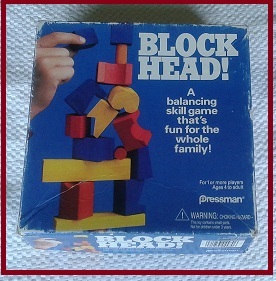 I have also used the game of Block Head. It is a game that has been out for a number of years, so you may have it. You could use regular blocks but you would not have the crazy shapes then. I adapted it for left and right practice by adding a spinner. The spinner is part of a set of spinners that are a free download at my TPT store. just click on the picture. 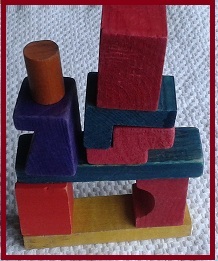 Block Head is a basic game of taking turns stacking different size blocks until someone knocks the block tower over. 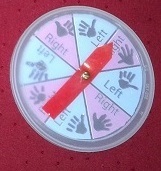 Students practice left and right by spinning the spinner and then using the hand designated by the spinner. Students can develop an awareness of which hand feels more comfortable to them and use that to figure out which hand is which. 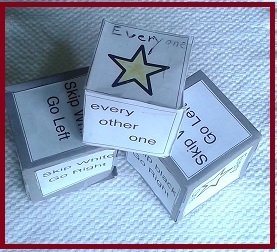 There is also a game I made up for my kindergarten concept groups called Skip and Pass. It is in the vocabulary section of this blog or you can click on the green lettering. A small group of students form a circle and each child has a black or white shape in front of them. I make die cut shapes. Students take turns throwing a large dice in the middle of the circle. The die indicates if students pass a ball or bean bag left or right around the circle and who is skipped according to the shape in front of them. It is a good game to teach group participation as well as several concepts including left and right. The pattern for the dice is included in the instructions. I hope you found these options useful. I am taking part in a linking party for special ed. blogs so check out some of these other sites. We love your comments. It keeps us writing. I thought I was going to have a break for a while but I find myself working in an elementary school again. There is a high need for substitute SLPs in the schools here and I couldn’t say no. On the bright side, it provides opportunities for blog post topics. 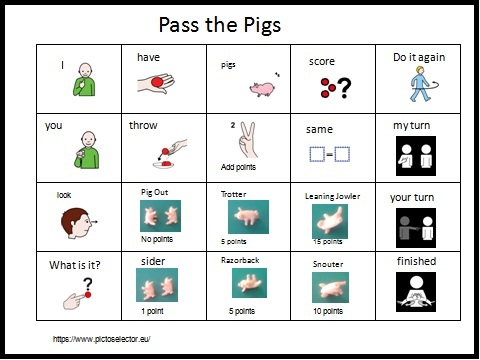 So now you are wondering how Pass the Pigs has anything to do with communication board software. Well this is a recent game I added to my collection and so I did not have a communication board or access to software to make one. Before thinking of making a purchase I started on a quest to see what was available on the web. I found Picto-Selector. I was surprised to see the possibilities with this free program. A donation is encouraged. Best of all sharing was not prohibited as long as you made sure you provided a link back to the site for recognition. The site is here: Picto-Selector. You do need to download and install a program but it didn’t take long and I was happy it passed the virus check on my computer. For a free product, I found the program to be quite flexible and user friendly. A library of pictures is available within the program. You can use their grids but I chose to use my Power Point program and make my own grid. I was able to drop pictures from the program and size them on that grid. This also allowed me to insert my own pictures of the pigs. I am happy with the results. You may want to give it a try. The board at the top is an example. 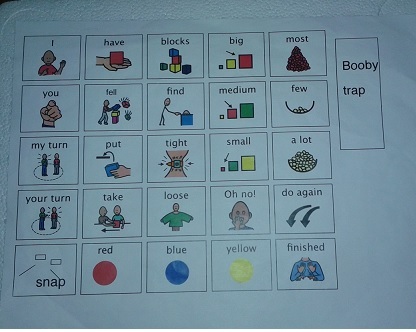 As I have said before, I found that providing communication boards and game activities not only aids nonverbal students but add structure for building sentences and listening skills for some of our students with language processing difficulties. Games can be used to reinforce turn taking and handling disappointment for those having difficulty with social skills. Deep breaths and dot pressure anyone? Here is your warning for a topic change. 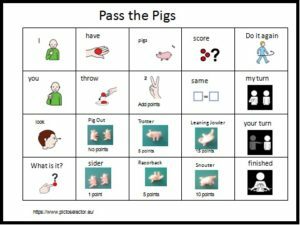 Recently I have I used Pass the Pigs as a game reinforcement. I was surprised to find my youngest students at the elementary school found this game appealing. A cup with 2 rubber pigs doesn’t seem that enticing to me. They were more then willing to give it a try though. As with most of my games, I adapted it for my purposes. Most of the students worked toward their goals as a prerequisite for taking a turn. This game was ideal for short turns. I simplified scoring for my youngest students. The score sheet that was included with the game was difficult to follow and we spent too much time figuring out pig positions for a score. I put the new scoring on a communication board for easy access. I also have some students who had a hard time dealing with the “pig out” score which meant they lost all points. I switched it to zero points which is difficult enough for some students to handle. 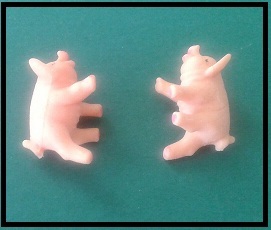 I also switched the scoring to if they got 2 pigs with scores above 5 they could add them together for the score. It was just easier to know that then trying to look up the variations. Each student was allowed one roll instead of going until they decide to stop. This was so turns remained short. No one knew the original rules so I didn’t have complaints. I joined the February blog link up for special education. It will bring you to similar blog sites. I know some of us do pirate themes in our therapy rooms at some point during the school year. It helps to develop that ARRR you know. This is a game that would work with that theme. I found this game unopened for a few dollars last year at a Goodwill store and decided I couldn’t go too wrong with such an inexpensive game. I see there are some 2nd hand ones you can order quite reasonably on ebay or amazon. Keep your eyes open for it at thrift stores or Goodwill. I used it for a variety of speech goals. 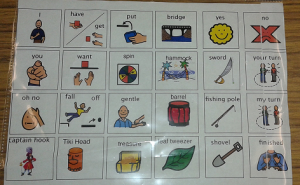 It is good for developing some vocalic r words such as sword, barrel, tweezers, treasure, shark. It also had quite a few sh, ch type words such as treasure chest, cash sack, shovel, beach, shark, bridge, and fishing pole. A lot of the items used in the game were not familiar vocabulary words such as tweezers, hammock, palm trees, and barrel. It seemed that everyone knew what a sword was. Finally, there was a good use of prepositions as there was a shark beneath or below the hammock, the hammock between the palm trees, and Hook hopefully staying above the shark. You of course can add other task cards to get more drill incorporated. It is not a game I would normally have bought. Some of my students have difficulty with small motor skills and this one looked like it could be frustrating for them. In the game, players move figures around a track. They land on squares that tell them to use various tools to remove treasures from the hammock without letting Capt. Hook fall. I was surprised to find that this game actually worked out quite well. Hook doesn’t fall off the hammock that easily. You can hook his heels into the hammock which makes him pretty steady. You can adjust the difficulty somewhat by his placement. Most of the students could find a tool that worked for them and the tools were quite motivating. Some students just used a tool to shove the treasure off rather than pick it up. 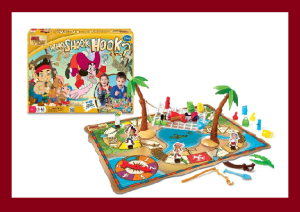 It was a fast paced game that didn’t end until all the treasures were gathered or Hook fell. Students enjoyed the challenge of the tools and didn’t get hung up on winning. 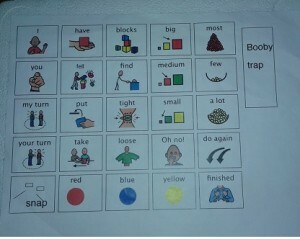 I was able to use the game for some of my early language learners so I made a communication board to go with it. You may notice that I try to keep my boards quite similar. The pronouns are to the left and connect easily to my core verbs that are usually want, have, get, or put. My middle area after the verbs has the vocabulary that changes and the far right is the my turn, your turn. This seems to work for me for being consistent and allowing students to find the words they need to develop short sentences and phrases. I print them out on regular paper and slip them into plastic page covers. The board is flexible so fits easily into the game box. I noticed that this game is being sold once again. I have used Tumblin Monkeys as one of my therapy games for quite a few years. It is a great game for general reinforcement, and can be played by early language leaners as well as my older elementary students. The game is similar to Kerplunk but looks like a palm tree. The sticks are a little easier to stick in than kerplunk. The monkeys are placed on top of the sticks and the sticks are pulled out one by one. 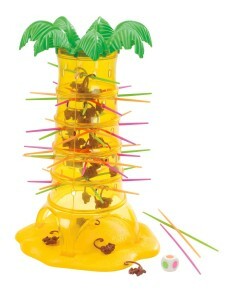 There is a little more strategy involved because the monkey tails get hung up on the sticks as they fall. The other thing I like is the use of dice. With the addition of a communication board my early language leaners are provided the opportunities to make comments such as “Your turn”, “my turn”, “I have pink” or make requests “May I have the die?” It also emphasizes the word “least” because the winner is the one with the least monkeys. 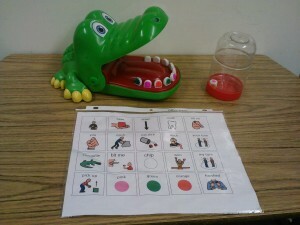 I use the following comunication board with my early language leaners. 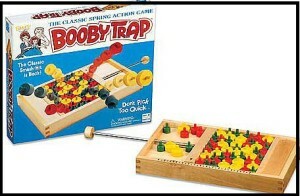 Many years ago when I was elementary school age, too long ago to mention, I received a game call Booby Trap as a gift. It survived my childhood and my mother handed it back to me when she cleaned out a closet. I added it to my therapy game collection and it became a good standby. The game was out of circulation for quite a few years so my students were often not familiar with it. Lately I noticed the game is back as a remake from the past and you can find some old ones on Ebay. It comes in a plastic versions and a wooden one. One of my students told me the plastic version is not as good because the pieces fly out easily. I will let you figure that part out for yourself. If you are looking for therapy games this is a good one and the wooden one has lasted my teaching career. The game is easy to learn. Basically students remove circular pieces that are held tight by a spring bar. If the wrong piece is chosen the bar will spring forward. Players pay a penalty for setting it off by returning pieces. Players choose from 3 sizes of pieces. The larger the piece the more points a students earns. This game is enjoyed across age levels to include high school level. It is sometimes hard to find games that are age appropriate for the older students who receive special education services. 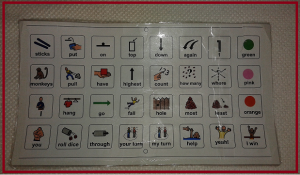 It works well for general reinforcement and for language learners with a communication board added. I use it to develop basic statements such as “I have…”, “I take/took……” “your turn” and “my turn”. 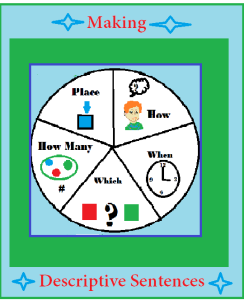 It is also good for developing statements with attributes such as colors, size, and amount. 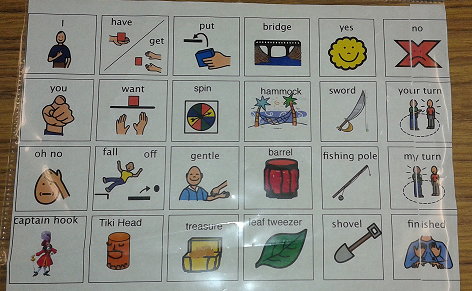 This is a copy of the board I use for my language learners. It is a year ago that I made the switch to a self hosted web site. I do not know why I waited so long. I have enjoyed having the freedom of decorating as I wish. There was definitely a learning curve, especially when I found it was hijacked at one point. Over all It has been worth it. I decided a free download was needed to celebrate. Continue on to find it. For some reason containers hold a certain fascination for me. It seems like I am always collecting them and thinking about how I can use them for speech therapy. While drinking my morning orange juice, I got to thinking about the cover to the juice container. It would make a good tile for a hiding game. It is at least 2 inches in diameter, can hold a reasonable size card on top, and a small object underneath. 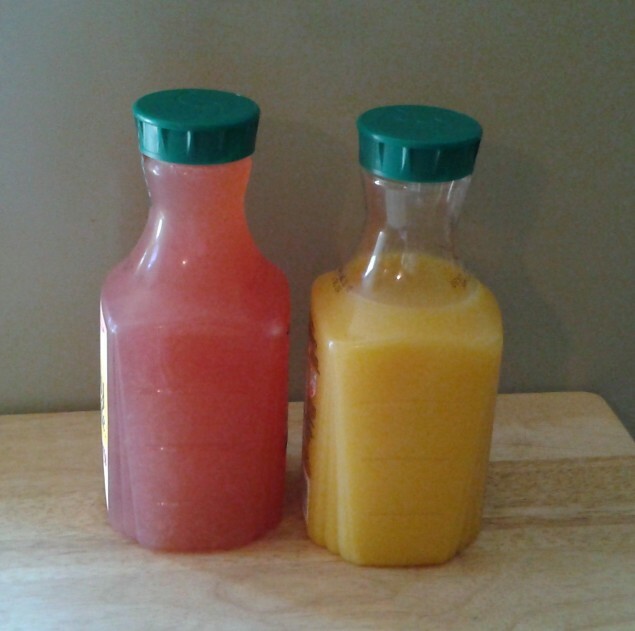 I also drink enough juice to get a number of them in a reasonable amount of time. This led me to thinking about the game of Secret Square and Cariboo. It seemed like it could be made into a game adaptation for either game. The covers just need velcro dots to fasten pictures on top. Do you remember the old therapy game called Secret Square? It was a game that had tiles with pictures on top. A chip is placed under one of the tiles. Students find it by asking questions about the pictured items and eliminating the pictures that do not correspond to the answers. Eventually the chip is found. 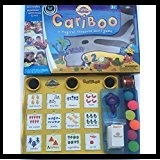 Cariboo is similar in that it has pictures on doors that can be chosen to find a hidden balls that is used to open a treasure box. Both games are very versatile when addressing goals for describing, questioning, and synthesis of information to get the main idea. It can also address articulation and specific speech vocabulary such as prepositions with a switch of the cards. Students love the idea of finding the secret object and it keeps them motivated. Unfortunately Secret Square and Cariboo are no longer in production. They can be hard to find and a bit pricey if bought second hand on e-bay. Which brings me back to my orange juice container lids. 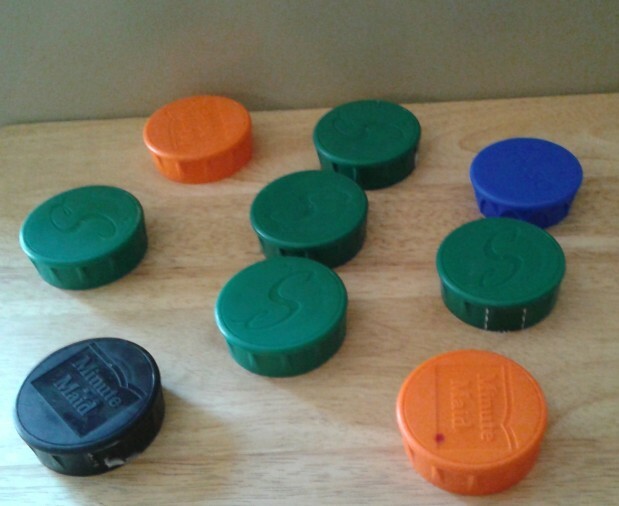 I could see potential for making a game of “Secret Circle” and possibly even a Cariboo type game with items hidden under the lids. This could include pieces of a puzzles hidden under some of the lids. All I needed to do was drink 10 containers of juice to get 10 covers and place velcro dots on top. Pictures for the tops can range from articulation cards such as found on Mommy Speech Therapy to preposition cards such as found as a free product at my TPT store. 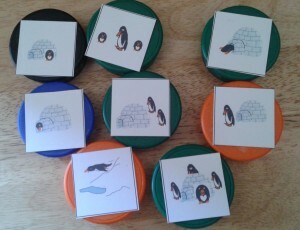 I updated and revised my Preposition Penguins especially for this post. There are a number of Cariboo cards on Teachers Pay Teachers that would also work. It is always hard this time of the year to find activities for group therapy with my Life Skills groups. There are usually 5 students in each group and the abilities are really varied. I try to include some motor activity because this keeps their attention. Using objects for actions is more meaningful for them then paper tasks. However there are a few students who have motor difficulties which makes it difficult for them to do some tasks and work with the group. My inspiration often comes from my closet. This is a picture of what I found. I decided to make a badminton type activity. 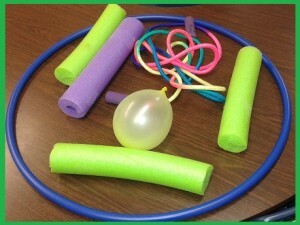 They used the pool noodles to hit balloons through the hulu hoop and then over the jump rope stretched across two chairs. We encouraged two students to hit it back and forth to complete turn taking. I reinforced the prepositions of over, through, below, under, and above. My early language learners practiced phrases such as “Give it to me”, “Hit it”, “I want it”. One of my students kept saying “there it is”. He was a student who we usually had trouble engaging and he blossomed with this activity. For a student with Downs he had amazing eye hand coordination. I hope he does badminton for Special Olympics. I liked the pool noodles because they didn’t hurt if students hit each other and the balloons slowed down the process enough that all the students were able to hit them. I recommend having spare balloons. We had one student who couldn’t resist squeezing and popping them.